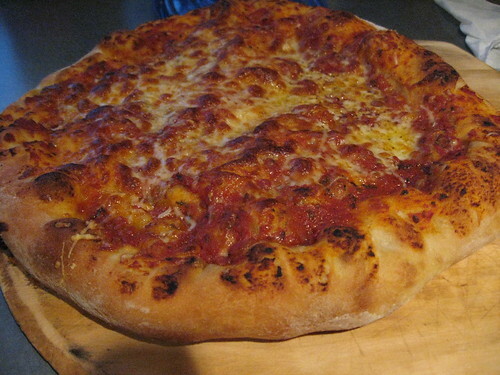 honey wheat crust, originally uploaded by Seligmans Dog. Dual posted from Flickr for the the podcast I have tonight with Jim and Andrew. This was originally to be a honey wheat kneadless boule. It did the first rise overnight for 12 hours, punched down and let proof most of the day today. When dinner rolled around, it's fate changed from a boule to a pie. 600 g into a 15" pie (3.4 g/in.2). I usually make a thinner crust (225 g/11" or 2.4 g/in.2).